After missing out on the playoffs a year ago, Attleboro will be relying on its senior leadership to try and earn a trip to the state tournament. Captains Jake Dunkley and Andrew Milliken will help anchor the team along with classmates Lucas Boucicaut, Berlyns Abraham and Robby Peirce. Dunkley was the second leading scorer in the league last year with 18 points per game while Milliken is another top scoring option for the Bombardiers. Boucicaut and junior Nate Douglas will pair up in the backcourt while freshman Bryant Ciccio will likely see plenty of minutes after his performance on opening night on Friday. Abraham provides length and athleticism down low and can make life difficult in the post for opponents. There is no rebuilding when it comes to Franklin, just reloading. Despite graduating a handful of talent, including the Hockomock League MVP Tim Prunier and a couple other strong players, the Panthers are still in a spot to challenge for the Kelley-Rex title. Two big reasons for that are juniors Paul Mahon and Connor Peterson. Both players started last year and were important pieces as the Panthers claimed a division title. With at least year of experience for both, look for both to be key players this season. Mahon has developed as a shooter to compliment his strong defensive game while Peterson continues to be one of the top big men in the league,. The Panthers will look to move the ball as much as possible on offense and hope to have a balanced scoring attack so defenses can’t focus in on just a player or two. Franklin has been on the better teams defensively in recent history and will look to continue that trend for the 2016-2017 season. “We are very excited about this group of guys,” Franklin head coach CJ Neely said. “Having a good balance of talent has made our practice games very competitive, everyone has really been pushing each other hard. Each year our goal remains the same, we will focus on day to day improvement and let the results take care of themselves. The Warriors are returning a strong group of players from last year’s squad with one noticeable addition — new head coach Mark Champagne. Champagne will have a group of experienced players to work with this season. Tom Madden, Noah Goodwin, Kyle Layman, Will Weir, Seth Sullivan, Pharaoh Davis and Justin Vine all saw either starting minutes or valuable time off the bench a season ago. Matt Lehoullier and Noah Bradley will also factor int this season to provide the Warriors with depth. Goodwin and Weir have the most experience and will captain the team along with Sullivan. Madden impressed last year as did Layman during his rookie campaign. 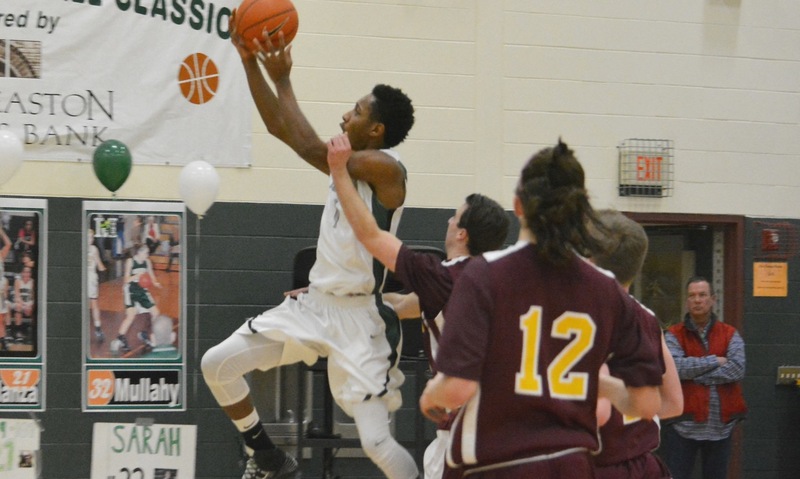 Between Goodwin, Weir, Madden and Layman, King Philip will have plenty of size to use down low. Davis and Sullivan are both strong with the ball while Vine provides KP with a shooting threat. Even though Mansfield won the Kelley-Rex division a year ago, the Hornets still might be bringing back the most talent in the league this year. After only graduating three seniors, Mike Vaughan has nearly all of his weapons at his disposal again this year. HockomockSports.com First Team selection Sam Goldberg (11.3 PPG, 7.9 RPG) leads a strong group back that includes Christian Weber, Matt Ehrlich, Max Boen, Phil Vigeant, Tyler Boulter and Evan Christo. Expect the likes of John McCoy, Sam Hyland and Kristian Conner to also factor in for the Hornets. It doesn’t matter who it is listed above, almost all of them are capable of being “the guy” on any given night, which makes Mansfield incredibly hard to defend. Weber, Ehrlich, Vigeant, Boen and Boulter are all strong from beyond the arc but also have no problem making the extra pass to find a better shot. The Tigers will face a steep challenge because of the switch to the Kelley-Rex division but bringing back a strong core of players will be a big help. Seniors Carter Evin, Dylan Mahoney, Nick Welch and Mike Graziano are all back as are juniors Matt Muir and Jack Spillane. All six players saw time last year, including some who started all season long. Between the returning players, the Tigers will be able to score from multiple positions. Evin, a HockomockSports.com Second Team selection, led the Tigers in scoring with 13.4 points per game – and did so in a variety of ways. Mahoney is able to shoot or attack the hoop while both Welchn and Graziano showed the ability to get hot from deep. While there will be some changes for Taunton this year, there will also be some similarities to last year. The Tigers will aim to use their speed and athleticism to their advantage and try to make up for their lack of size and experience. The youthful Tigers will by led by the very experienced Tommy MacLean, who has played varsity minutes since his freshman year. Junior Tyler Medeiros is back after suffering an injury early last year while junior Lens Esquil also got some minutes a year ago. Junior Malik Charles, sophomores John Martin and Luis Vendrell and freshmen Dante Law and Naz Kenan are all likely to factor in for Taunton this season. Another positive early on for Taunton is shooting, boasting a handful of players that can consistently knock down shots from deep. 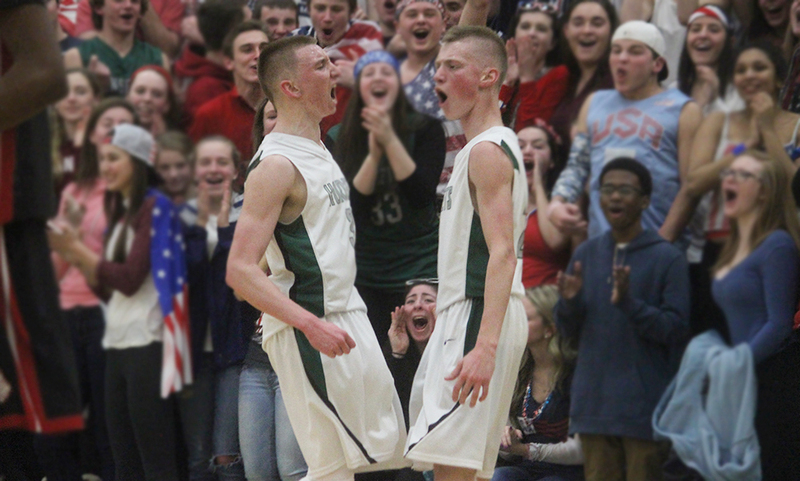 Click here for the 2016 HockomockSports.com Boys Basketball Awards. MANSFIELD, Mass. – One by one, each Mansfield starter made a contribution to keep the Hornets in the game offensively. And together as a unit, the Hornets locked down on the defensive side in the second half. In the end was a 64-60 win for the 4th seeded Hornets over the #5 seed Brockton Boxers. Trailing 36-32 to start the second, Mansfield’s focus on getting stops paid off, allowing the Boxers to score just six points in the third quarter. Meanwhile, the offense roared to life with 16 points to take a lead into the final quarter. Mansfield shot just 23% from three point range on 13 attempts in the first half but opened the second half with a set play that resulted in a three from Christian Weber (13 points) from straightaway. The Hornets got stops on four the next five trips up the floor from Brockton and took the lead with 5:34 to play on a layup from Weber. With the game tied 40-40, the Hornets ventured on an 8-2 run over the next 4:40 to secure the lead for good. Weber drained another three off a pass from Max Boen (team-high 14 points) and then Boen drained a three of his own – while getting fouled – to put the Hornets up 46-40. Phil Vigeant added a bucket in the paint before Brockton was finally able to break the run with a bucket from Jonathan Duvivier (34 points) in the final seconds of the third quarter. The Boxers pulled within three to start the final frame but another trey from Boen and an up and under take from Weber – plus the harm – pushed the lead back to eight with 6:28 to play. Boen then drove down the lane for a layup to give the Hornets a 57-46 lead with 4:10 to play. In the first 12 minutes of the second half, Mansfield limited Brockton to just 10 points. “Christian did a great job on Jonathan [Duvivier] in the second half,” Vaughan said. “In the first half we got everything comfortably, in the second half he really had to work and grind to get that. I think the third quarter was ultimately what put us in the driver’s seat. Brockton made a final push over the next two minutes – aided by an extended press – getting within five points at 57-52 with three minutes to play. But off an inbounds from the baseline, Boen found Weber in the corner for a three to make it 60-52 with just over two minutes to go. The Boxers had two chances in a six point game but both Boen and Evan Christo stepped in and took charges on consecutive series to force turnovers. Sam Goldberg and Phil Vigeant combined for four free throws down the stretch to seal the game. Brockton’s best offensive quarter was the opening frame, dropping 22 points while shooting 50% from the floor. Senior Nick Baskin poured in nine of his 11 points in the first quarter to help the Hornets stay within striking distance, trailing 22-14 after one. 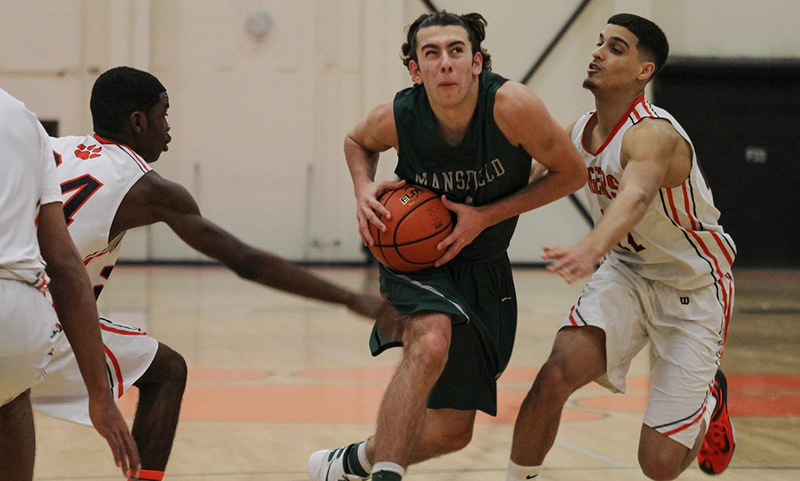 The Boxers scored 14 points in the second quarter but junior Matt Ehrlich stepped up offensively to once again keep Mansfield in the game. Ehrlich was 4/7 in the quarter, including a three midway through and scored all nine of his points in the quarter. Goldberg, who had 11 points and 10 rebounds, scored in every quarter. Mansfield’s starters combined for 58 of the team’s 64 points. Mansfield (20-4) advances to the D1 South Semifinals for the fourth straight year. For the third year in a row, the Hornets will face off against Catholic Memorial. In 2014, the Knights beat Mansfield in triple overtime in the sectional semifinal while in 2015 beat the Hornets in the sectional final. Mansfield boys basketball and Catholic Memorial are set to face off the D1 South Semifinals at Newton South with a date and time still to be determined. MANSFIELD, Mass — New Bedford dominated play early and had the 4th seeded Hornets on upset alert with a seven-point lead at the end of the first quarter. Luckily for the Hornets, the next 24 minutes proved to tell the true story of the game. Mansfield turned a double-digit first half deficit into a 20 point win, taking a 75-51 decision over New Bedford. The first quarter started rough for Mansfield as New Bedford’s Dejay Burgo (23 points) started on a hot streak. Burgo shot a perfect 4-4 from the field to start the game, compiling 11 points in the game’s first eight minutes. The Hornets scrambled to keep pace with the impressive shooting from New Bedford but found themselves trailing at the end of the first quarter. With their deficit reaching as many as 11 points, Mansfield battled back to enter halftime with a 10 point lead. The Hornets 26-5 run began with back to back three pointers from Matt Ehrlich, who went on to score 12 points in the second frame. Following his big shots, Ehrlich continued to capitalize on opportunities finishing two three-point plays to give Mansfield their first lead of the night. “I thought defensively, even though we gave up the big quarter point wise, the shots they were hitting were tough shots,” Mansfield head coach Mike Vaughan said. Following a first quarter in which New Bedford seemed to dictate the game with their superb offensive play, Mansfield’s defense took a stand. Led by Sam Goldberg (10 points, 10 rebounds) the Hornets managed to gain control of the boards and in turn gain control of the game. Goldberg and company turned defense into offense as rebounds quickly turned to odd man opportunities. A fast break layup from Goldberg and a Tyler Boulter three-pointer to beat the buzzer carried the Hornets momentum into the halftime break. New Bedford brought the game within seven points to start the second half but the Mansfield offense proved to be too much for the Whalers to handle. The Hornets consistently drove down the lane finding many high percentage shot opportunities as the game carried on. Led by Christian Weber (12 points, five assists) and Phil Vigeant (eight points, five assists), the Hornets finished the third quarter on a 15-3 run and never looked back. Swift passing and sharpshooting carried the Hornets down the stretch as they cruised to a 75-51 win in their first round matchup. Next up for the Hornets is a rematch with the 12th seeded Brockton Boxers on Friday night at 6:30. Mansfield will look to avenge an overtime loss to the Boxers from earlier in the season.